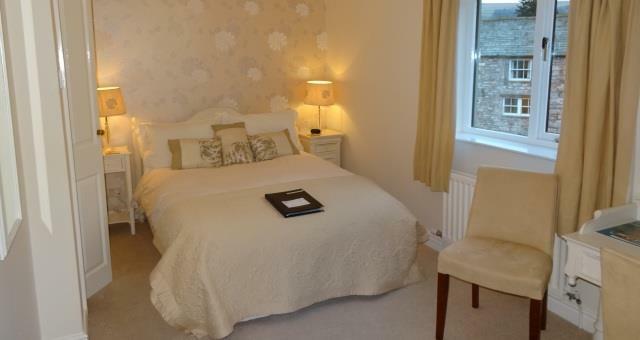 Ullswater House01768 486292work Bed & Breakfast"....Cumbrian Hospitality delivered with Integrity...."
At Ullswater House we have 5 en-suite letting rooms - a combination of twin, double, super-king and family accommodation. All rooms are decorated and furnished in a contemporary manner, each complete with flat-screen TV, luxury bed linen and towels, well stocked complimentary hospitality trays and locally produced organic toiletries. Free Wi-Fi and EV Charging is also available on request. Our guests have access to free off-road parking, bicycle storage and washing/drying facilities for those rare wet days. We also have a garden and outdoor seating areas which our guests are free to enjoy. 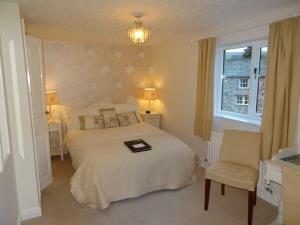 Ullswater House sometimes limits bookings to 2 or more days. Family room sometimes limits bookings to 3 or more days. "....Cumbrian Hospitality delivered with Integrity...."
A warm welcome is assured to groups such as wedding parties, family reunions, clubs and event participants. We offer a flexible approach to our customers' needs, early or late check-in, breakfasts etc. can all be arranged upon request. 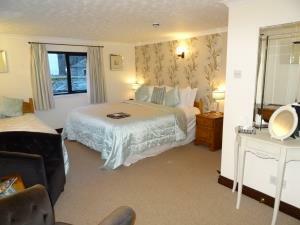 Single night telephone bookings are welcome throughout the year. Ullswater House is centrally located within the village of Pooley Bridge at the Eastern end of Lake Ullswater. and about 5 miles from the M6/A66. The Village is home to 3 excellent pubs and a Bistro, which serve lunch and evening meals. A range of shops including cafes, gift and outdoor suppliers and a well stocked village store and post office combine to cater for a range of needs, with the lake shore and the famous Ullswater Steamers just a couple minutes walk away. Free EV charging now available. Children welcome from any age. Leave M6 jct 40 follow signs for A66. when your reach the Rheged roundabout follow A592 to the end of the lake and turn left into Pooley Bridge. Over bridge, on left after village square. By bus from Penrith railway station and town centre, 108 Penrith-Patterdale. bus stops in Pooley Bridge 15 yds from our door.